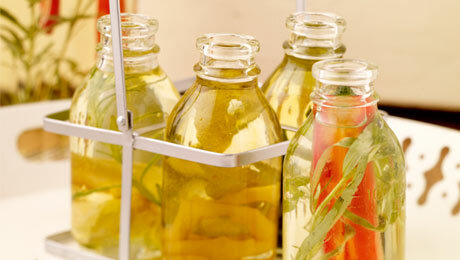 Just pick from rosemary, lemon, garlic and chilli to make your own flavoured oil. Gently heat the oil in a pan over a moderate heat and add your chosen ingredient and sauté gently for 4–5 minutes. Pour the contents of the pan into sterilised bottle/jar using a funnel. Seal the bottle and store in a cool, dark place. Once opened used within 1 week.